Simple affection is so rare in the movies. Shyness and resentment are also seldom seen. Love is much talked-about, but how often do we really believe that the characters are in love and not simply in a pleasant state of lust and like? Fragile emotions are hard to portray in a movie, and the movies that reach for them are more daring, really, than movies that bludgeon us with things like anger and revenge, which are easy to portray. "On Golden Pond" is a treasure for many reasons, but the best one, I think, is that I could believe it. I could believe in its major characters and their relationships, and in the things they felt for one another, and there were moments when the movie was witness to human growth and change. I left the theater feeling good and warm, and with a certain resolve to try to mend my own relationships and learn to start listening better. All of those achievements are small miracles for any movie, but especially for this one, which began as a formula stage play and still contains situations and characters that are constructed completely out of cardboard. 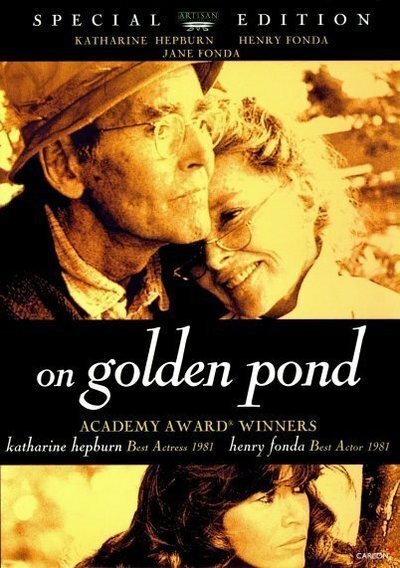 The story of "On Golden Pond" begins with the arrival of an old, long-married couple (Henry Fonda and Katharine Hepburn) at the lakeside cottage where they have summered for many years. They know each other very well. Hepburn, of course, knows Fonda better than he knows her -- or himself, for that matter. Fonda is a crotchety, grouchy old professor whose facade conceals a great deal of shyness, we suspect. Hepburn knows that. Before long, three more people turn up at the pond: Their daughter (Jane Fonda), her fiancé (Dabney Coleman), and his son (Doug McKeon). That's the first act. In the second act, the conflicts are established. Jane Fonda feels that her father has never really given her her due -- he wanted a son, or perhaps he never really understood how to be a father, anyway. Jane tells her parents that she's spending a month in Europe with Coleman, and, ah, would it be all right if they left the kid at the lake? Hepburn talks the old man into it. In the central passages of the movie, the old man and the kid grudgingly move toward some kind of communication and trust. There is a crisis involving a boating accident, and a resolution that brings everybody a lot closer to the realization that life is a precious and fragile thing. Through learning to relate to the young boy, old Fonda learns, belatedly, how to also trust his own daughter and communicate with her: The kid provides Henry with practice at how to be a father. There is eventually the sort of happy ending that some people cry through. Viewed simply as a stage plot, "On Golden Pond" is so predictable we can almost hear the gears squeaking. Forty-five minutes into the movie, almost everyone in the audience can probably predict more or less what is going to happen to the characters, emotionally. And yet "On Golden Pond" transcends its predictability and the transparent role of the young boy, and becomes a film with passages of greatness. This is because of the acting, first of all, but also because Ernest Thompson, who wrote such a formula play, has furnished it with several wonderful scenes. A conversation between old Henry Fonda and young Coleman is an early indication that this is going to be an unusual movie: A man who is forty-five asks a man who is eighty for permission to sleep in the same room with the man's daughter, and after the old man takes the question as an excuse for some cruel put-downs, the conversation takes an altogether unexpected twist into words of simple truth. That is a good scene. So are some of the conversations between Hepburn and Fonda. And so are some remarkable scenes involving the boating accident, in which there is no doubt that Hepburn, at her age, is doing some of her own stunts. It's at moments like this that stardom, acting ability, character, situation -- and what the audience already knows about the actors -- all come together into an irreplaceable combination. As everybody knows, this is the first film in which Hepburn and the two Fondas have acted in any combination with one another. Some reviews actually seem to dismiss the casting as a stunt. I believe it adds immeasurably to the film's effect. If Hepburn and Henry Fonda are legends, seen in the twilight of their lives, and if we've heard that Jane and Henry have had some of the same problems offscreen that they have in this story, does that make the movie simple gossip? No, not if the movie deals honestly with the problems, as this one does. As people, they have apparently learned something about loving and caring that, as actors, they are able to communicate, even through the medium of this imperfect script. Watching the movie, I felt I was witnessing something rare and valuable.